Throughout the day when western comic books ruled the racks, Dell signed up practically every TV western that came along, licensing some 61 TV series for comic adaptation. Some like BONANZA, GUNSMOKE, RANGE RIDER etc. ran for 20-40 issues while less successful series only lasted one or two issues. 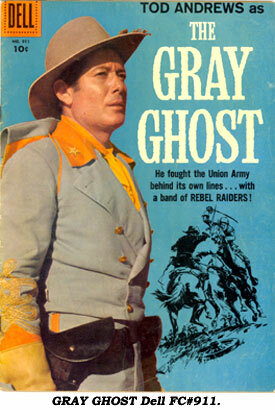 The very popular “Gray Ghost” TV series originally ran for 39 episodes in ‘57-‘58. Dell published THE GRAY GHOST as Four Color #911 in the Summer of ‘58 followed a year later in June-August ‘59 by FC #1000. Although the series went into syndication, no further comics were issued. 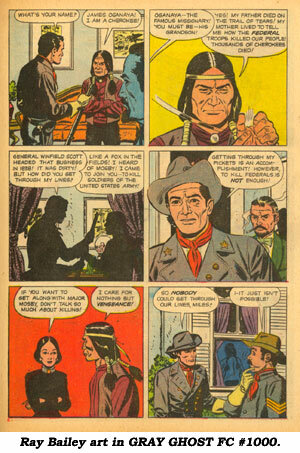 All four stories in the two issues were taken directly from TV episodes. FC #911 was possibly drawn by noted equine artist Sam Savitt (1917-2000). It’s for certain Savitt contributed some art to the cover (alongside a photo of star Tod Andrews) but the interior work has not been verified, although it certainly resembles Savitt’s excellent horses. FC #911 also has inside front cover photos. FC #1000 was drawn by Ray Bailey (1913-1975) who also worked on CISCO KID, BOOTS AND SADDLES, HAVE GUN WILL TRAVEL and others for Dell. This issue also has front cover and inside front cover photos. All four stories in the two issues were adapted from TV scripts. Both issues bring $24 in Fine condition.